I'd like to welcome our new followers, and remind everyone of our amazing, exclusive Audience With an Agent contest. Six winning fiction entries will be read by Wendy Lawton of Books & Such Literary Agency. Click on the "promotions" tab for submission guidelines. Please read and follow the guidelines carefully, and get your manuscripts to us by July 31. As I sit at my desk writing my latest novel, I have a collage of my main characters before me. When I create characters for a new book, their names have to be just right. I experiment with different names, as if they were a taste to be savored, until I hit on exactly the right one. I always know when I've found it, for it's as if someone has just introduced me to that "person." But not until two books ago, when I wrote Lying on Sunday, did I spend as much time searching for the right faces to go with the names. Now as I develop my character profiles I spend a day or two navigating through "headshot" sites until I find the perfect image that correlates to the one in my mind for each of my main characters. The benefits are that I feel I know them better than ever before, and it's easier to keep track of their physical attributes, so I don't give someone green eyes in Chapter 1 and brown eyes in Chapter 12. For me it's added another dimension to the discovery process. And after all, that's what a novel is all about--for the reader and the writer: becoming acquainted with someone new and learning as much of her story as she's willing to share. "I watched the new girl swing her leg out from under her red skirt--a brown leg, darker at the knee than the thigh, and darker still more at the calf. And I watched the boys watching the brown, or maybe the shape--I wouldn't know what boys see when they watch--of first one leg then the other, and not a one of them . . . able to talk . . . Me, I had a spasm of wanting to stay put myself, of fear that tripped up my feet and made me wish desperately I could miss this one trip to the Blue Hole with our mangy pack and the new girl. Because I was beginning to think what a bad, what a truly remarkably bad idea this whole thing might be." Trust me, it only gets better from there. "Laura-Lea marched to the center of the room and, hands on her oh-so-slim hips, she planted her feet far apart on the floor. I wouldn't have been surprised if she'd produced pom-poms and broke out into a catchy cheer" from Bonnie Grove's Talking to the Dead. "But Jane isn't a paralytic, and she isn't a child at rest in my lap. 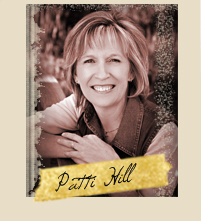 I may lower her through the roof to Jesus' presence, but chances are she hops off the mat and elbows through the crowd toward the door" from Patti Hill's upcoming novel Seeing Things. "'I really didn't know I had an audience, or I might have spent more time on my costume . . . You know, something with veils. Orange and pink and red ones, I think. Maybe a belly button ring.' She lifted her shirt and tugged at her waistband to regard a freckled stomach. 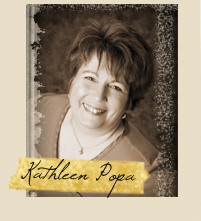 Like a sack of Jell-O, Dara thought" from Kathleen Popa's To Dance in the Desert. "Kirsten Young lay on her back, a serence Ophelia in her dusky pond of blood . . . No, no, she wasn't Ophelia at all, he thought. 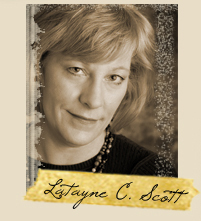 She was Eve, temptress and sinner cast from the garden of Utah, wearing a hasty apron of cottonwood leaves heaped around and across her plump belly" from Latayne C. Scott's Latter-Day Cipher. 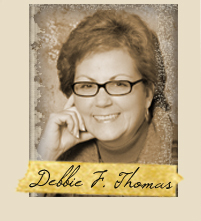 "If my life was a made-for-TV movie, it would start this same way, with the monster truck pulling up in front of Grandma's and this Barbie-wannabe getting out" from Debbie Thomas's Tuesday Night at the Blue Moon. As a writer, what methods do you use to create your characters? How detailed are you in their development? And as a reader, how much information do you want to know about a character's appearance? Does too much or too little affect your enjoyment of the story? I'm with you, Sharon. Names and physical descriptions are so important to fully cement that character in the writer's mind as the story unfolds. Sometimes the names are historically appropriate or they may convey something descriptive about them. I used the last names of Winslow and Lockhart in my first book to describe the troubled relationship between mother and child. (As in, the mother was slowly winning the child and the child's heart was locked against it)I'm not sure if anyone caught it, but it meant something to me as I wrote it. When I look for faces, I try to go with actors who have portrayed similar characters in movies. I chose Mia Farrow for 'Raising Rain' because there were pictures of her with 70's hair, and also many others of her as she aged, which was helpful for my story. I don't give many physical descriptions, either. I chose to describe Andie in 'Tuesday Night' with her grandmother's comment that she looked like a blonde Xena (Warrior Princess). I felt that it gave subtle clues as to her inner strength and determination. I admit that creating the characters is like eating dessert first! Yes! The more I read and write, the more I appreciate discreet description. I'm much more interested in knowing who the characters are, not what they look like. If an author I'm reading using too much description, I skip ahead, so I figure readers have done the same with mine. I also search and search for head shots and make them part of my character profiles, which run three-five pages long. This was more challenging with the historical fiction I'm now writing. Modern people of age carry themselves and dress so differently. I found some documents from the WWII era that helped, plus a couple characters came from movies of that era. Having these visual cues adds an important dimension to my understanding of the characters. What do you mean, Sharon, my headshot sites? Thank you for validating the process of finding "pictures" of characters. It helps me immensely to have an actual picture to visualize. I scour catalogs constantly. My notebooks are full of character background information that will never make it into a book, but it helps me 'know' them. When I read, I only want vague physical details. Too many and it interferes with my mental pictures. 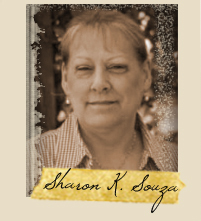 Sharon, could you share your headshot sites? I obsess on the names, making myself crazy with baby name books and sites, and I have pictures of the characters in my head, but the latest novel is the first time I used a picture of someone as a jumping off point. What I'm wondering is what are your "headshot sites"? Where do you all go to find all these various pictures of people in one place? As a reader, I like at least enough physical description to know the basic "type" of person, especially in contemporaries. In historicals I want more than that. A quirk of mine is bone structure. I want to know the shape of a character's head. I got that way from reading Ellis Peters. What turns me off is no physical description of the main character at all. It makes me feel un-anchored. Yes, Sharon, please share your headshot sites. When I look for headshots I typically Google "women's headshots", which brings up a host of sites that contain women's, men's children's headshots, then I browse through the photos until I find one that strikes my fancy. This is one of my favorite sites http://tinyurl.com/p6lpxr. I will also Google an actor's name if I have someone in mind for a character. I'm laughing as I look at my collage, which contains a photo of Simon Baker, who is my very nice not-so-nice guy in my WIP. I laugh because on Twitter I've learned there are several authors using Simon for a character. I selected him because of his role in The Devil Wears Prada. He was exactly the kind of seductor I was looking for. Your name choice for Tuesday Night at the Blue Moon is very interesting. Great symbolism. I'm learning from you Sharon. My approach to characters, so far, has been too intuitive to explain. I'm nearing the end of my second novel and already there are some characters standing in line for my next book. Beats me where they come from. One in particular stands out and she has my full attention. She's a bit frightening, actually. And she only speaks to me in poetry. Which is frightening to me because I DON'T write poetry. I wonder where she'll take the next novel? Thanks for those links, Sharon. Thanks for the great links, Sharon! There's a sign at the corner store that I just may buy for my office. It reads, "I live in my own little world, but it's okay. They know me here." The best advice I can offer in the way of character development is that you talk to your characters, and get comfortable with the fact that they will talk back. I've tried filling out those character questionnaires you see in books, but the problem is, unless the character tells me what color her Volvo is, I just don't know, and won't know till she drives it on the set. Once she does, however, I'd best note down someplace that it is an orange Volvo, or she's apt to turn up in a green one next time just to mess me up. The writing goes a lot better when I've built a fairly close relationship with my characters. They don't have to tell me where they went to school unless it comes up, but I want them comfortable enough to interrupt me when they find it necessary, to make a snarky remark when the mood strikes. Brandilyn Collins wrote a great book about this process titled Getting Into Character. I've got pictures posted above my desk as well. Sometimes I use photos of actors, though I usually try to pick one I haven't identified too strongly with a particular character-type. It won't do to have Ace Ventura taking over my radio-preacher's life - unless I want him to. In To Dance in the Desert, Finis had the face of a million silver-haired preachers I have known, but he had Robert Duvall's voice. I like to browse through old People magazines for photos. Most of the photos are of people in the entertainment industry, and I can look online for more pictures of them in different situations or poses. Katy, I love the sign. Can I copy it?? Yes, our characters talk back. Any writer who isn't comfortable with that should try, maybe, painting? Bonnie, your new character sounds awesome. Really. Can't wait to learn more about her. Thank you all for your comments. This is a fun subject for me. I love learning from you as well. But I'd love to hear from more readers about how they like their characters presented. As authors, we hope to provide just the right amount and the right kind of details to evoke something in the reader. It becomes kind of a private agreement between the author and the reader. Of course, when an image of a character is on the cover of a book, the reader begins with the artist's conception of that character, and I believe the reader uses the written descriptions to ratify the visual image. A good example of this, I think, is Jill Eileen Smith's Michal. 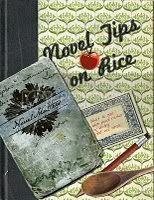 It has an arresting picture of the title character on the cover. Same thing happened with people who saw my book trailer for Latter-day Cipher. Even though I'd described the first murder victim as having a "plump" belly; and the Native American woman, Eliza, as having strong ethnic features, several people expressed surprise at how they were depicted. I in fact chose people to play those parts in the video who were not "glamorous." And of course this phenomenon (of a reader being surprised at a later visual depiction of a character) -- it happens all the time when movies are based on beloved books. Do any of the rest of you have examples of when you were disappointed in how a character was portrayed visually? Latayne, I've been disappointed lots of times, but here's an example of a time when I wasn't. I read To Kill a Mockingbird in high school and the whole time I kept thinking, "Atticus is Gregory Peck." There was no question in my mind. Not because of physical descriptions, but because of the complete character. I could HEAR him in the dialogue. Then I saw the movie, and sure as the world, he was. I was amazed by that. My biggest disappointment with the appearance of an actor was in The Fellowship of the Ring. When Elrond came on the screen - a full headshot looking down - I actually said "ewwww" out loud in the theater. It was all the more jarring because the casting had been so good up to that point. I tend to give relatively little description of my characters, with just a few words about body type and colouring to give the reader something to latch onto. Anything other than that usually has more to do with characterization than appearance. A master at description is John LeCarré. Everything he tells you about a character's physical appearance tells you so much about who they are. You won't necessarily ever discover what colour their eyes are but you never care. What I heartily dislike is when a writer gives me a shopping list of physical attributes. Lists are boring, and you'd have to study those things like a test to get them to stick in your head. If I want to play Mister Potato Head, I'll go buy the toy. Okay okay... Ever wonder what Jesus looked like? I always thought He should be more Middle Eastern... you know, Jewish! I often get pictures in my head of characters and then think a movie fell short. On the other hand, I saw Princess Bride before I read the book, and Robin and Cary and gang fit the cast to a "T". 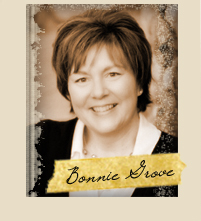 In Bonnie's book we did a rough trailer that only a few peole saw - and in it we had a woman that Bonnie said was right. The cover has the long hair. Maybe the official trailer is after she gets her hair done... and she raises her eyebrows just a "tich" at the end - it's not a spooky book! Word verification - linces: Small, pointy sticks my brother uses to poke people with. Knights of old used bigger ones and rode on horses. I don't need a portrait supplied for me, but I do want some basics, and preferably early on. I've had some times that the jarring happened not with the movie, but within the book itself, where no description was given early on, and then about halfway through, when I had a firmly established picture in my mind of my favorite character, they are described as almost the complete opposite. It was so disturbing that it made finishing the book difficult. I kept having to stop the scene and replay it with the new description. When I was young, so long ago, I watched the movie of The Outsiders, and then was tickled to find it in my high school library. Thing was, in the movie, Matt Damon played a tough street kid - fine. In the book, that character was described as short, wirey and thin, face like a fox with hair so blonde it was almost white! Completely changed the dynamic of the character, and I liked the book version so much more! Gave me an early education in what movies can do, and what novelists shouldn't.